The modular design allows simple and rapid changeover to different configurations. On most changeovers, realignment is not required. The Lynx Eye detector allows high quality datasets to be collected in a fraction of the time for conventional scintillation detectors. This brings data refinement strategies into the realm of routine analytical methods and allows systematic studies to be performed in great detail The 9 sample auto-changer allows 24 hour unattended operation A significant suite of software is available for data analysis, this extends from The Brüker Eva package coupled with ICDD PDF-2 database for phase identification, through to the General Structure Analysis Software (GSAS) and also Topas for full structure determination. We also have a suite of Crystallographica Search/Match software available from Oxford Cryosystems. The standard geometry ?-? geometry utilises a high resolution scintillation counter for excellent quality datasets suitable for structure refinement. 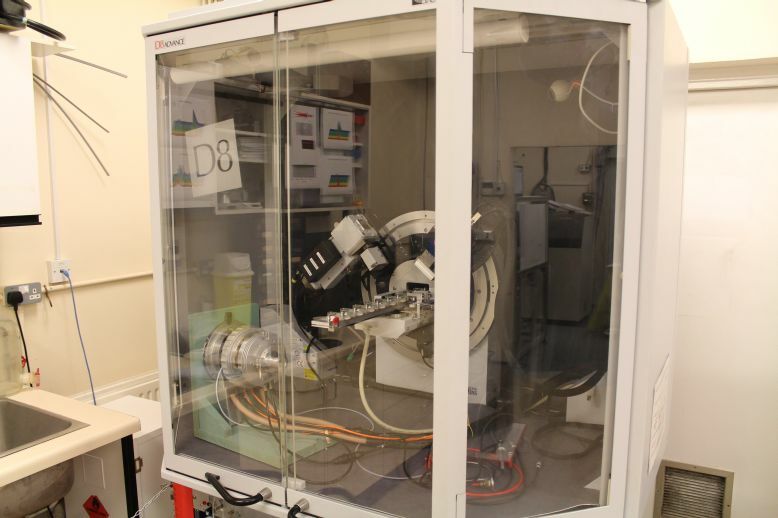 Long Soller slits and LiF monochromator crystal setup available for thin film measurements also known as glancing angle or grazing angle measurements). Films down to 40nm have been characterised with this attachment A Lynx Eye silicon strip detector is also available as an alternative to the scintillation counter. This has similar resolution, but because of the 197 strips available, can reduce the count times by a factor of almost 200. with little loss of resolution. (See Figure below right). A 9 position sample changer allows continuous unattended data collection, enabling large numbers of high quality data sets to be collected routinely. An Anton Paar HTK16 high temperature stage capable of reaching 1600 C is available and easily exchanged with any of the other optics (centre and right hand imagers above). The chamber also has gas purge facilities, for either inert or reactive atmospheres. Coupled with the Lynx Eye enables real-time measurement of phase changes and melting phenomena.